Humanity using robotics for everyday tasks is not a new concept, and has often been explored in both fiction and science. We've also theorized of moments when things go wrong, and our terms with the machines are somehow soured, usually resulting in conflict. But what if there was a world where both humanity and machines could co-exist, but independently of each other? That is, two parts of a complete ecosystem on our planet. 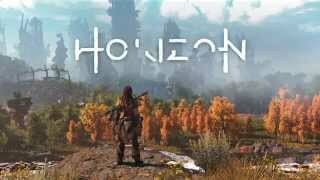 This sort of original scenario is presented by Horizon Zero Dawn, a PlayStation 4 exclusive from the creators of the Killzone franchise, Guerrilla Games. In this unique setting, where machines have replaced much of the traditional animal kingdom, players will assume the role of a young tracker and hunter who ventures out to learn the truth of her past, and where the machines came from. The game takes place on Earth, in the far future. An unknown event has occurred, which nearly wiped out the human race – now called the “old ones”. Many years have passed, and while humans were able to survive as a species and rebuild, they had to go back to more basic technologies and have largely regressed to a tribal society structure. Nature has taken over the land, much as it was before the dawn of modern civilization. Exploring the game, players will also come across fragments of the old world – ruins of modern buildings, cars, and so on. But more importantly, humans now also share the Earth with the machines - evolved mechanical beasts that are now part of the planet’s ecosystem, with many different sizes, behaviors, and abilities. They co-exist with the humans and whatever actual natural wildlife remains, creating a very unique vision of the world, where sci-fi is mixed with a new dawn of mankind. Players assume the role of Aloy, a young woman who was raised by an adoptive father. They are both outcasts from their tribe, and Aloy is “motherless”, a notion that is explained fairly quickly through the story. However, she has an opportunity to return to the tribe by completing the Proving trial, for which she trains all through her young life. When the time comes, she enters the competition despite many members of the tribe being hostile towards her. Just as the trial concludes, the competitors and judges are slaughtered by a mysterious group who seemingly want to go after Aloy specifically. She escapes with her life, and the elders decide it is time to reveal how she was first discovered as a baby. They also grant her the status of a Seeker – a rare honor that allows a member of the tribe to venture out beyond the familiar lands and follow a greater purpose, exploring anywhere they wish. Thus, Aloy sets out on her quest to avenge her tribe members, and also discover more about the “old ones”, the machines, and her own family. The main story in the game is actually quite engaging. Though it doesn’t offer anything groundbreaking, it is really well told and put together, and keeps players involved with Aloy’s adventure. It manages to captivate on an emotional level because the characters and dialog are rather well written and presented, Aloy herself is quite likable as a character, and the story never drags the mystery along. Instead, we learn relatively quickly about the basics of Aloy’s past, with an engaging twist, and natural curiosity drives the story forward. The narrative avoids the pitfalls of dangling a carrot in front of the players for the entire duration, instead opting for meaningful gradual reveals to a mystery for which we already know the ending. It's a satisfying story that makes for both an interesting adventure and a good piece of original sci-fi. It's one of the more interesting and well-told original narratives seen in a game for some time. Anytime you're talking with key characters, there are dialog choices that can extend the conversation with optional details. There are also occasional choices to be made, called Flashpoints, where Aloy can decide between being sensitive, reasonable, or strong willed. These choices affect how the scene plays out, but not much beyond that. There is also a secondary main story that runs in parallel to Aloy's discovery of the world. This narrative involves members of the nearby tribes, ones that are more advanced as they have large settlements surrounded by castle walls, compared to Aloy's humble village. With greater progress come bigger issues, and this tribe is faced with conspiracies, political intrigue and treachery. Unlike Aloy's search for the truth, this secondary adventure is far less interesting; a generic tale that could have taken place in any other fantasy RPG game. The same can be said about side quests. These range from longer missions that usually involve multiple characters and locations, to simple fetch tasks. You could be asked to make a delivery, recover a lost item, or help save someone from danger, but they all boil down to lots of running around and talking to characters about mundane problems. The side quests are rather predictable and often boring, offering short stories that you've heard many times before in RPGs, and rarely involve anything interesting to do with machines. The side quests encourage you to push out further into the game world, but they are not particularly engaging, and dilute the exciting main story. Horizon Zero Dawn is an open world RPG, though with complex action gameplay mechanics as well. This means that almost everything you do grants experience points towards the next level, which in turn earns you skillpoints and a tiny health increase. These points are spent in one of three categories - Prowler, Brave, and Forager - each featuring a linear set of three further skill trees. The abilities you unlock range from boosting your melee attack, to stealth attacks from above in Prowler; faster reloads, extended time slowdown, and better bow precision in Brave; and improved gathering and crafting skills in Forager. The leveling curve feels appropriate – doing the occasional set of side quests and battling the machines out in the open world, you will always be on-par with the recommended level for the next main story quest. However, that isn't to say that the game melds its RPG and action aspirations together all that well. While main quests are fairly easy, you'll often be travelling to edges of the map to complete them, and on the way you will encounter beasts that are usually far stronger. Your options are to take them on in combat and improve faster than the game intends, or ride / sneak past them on the way to the objective. Because I completed a few side quests and did plenty of hunting early on, I was quite overleveled for the main quests for the rest of the game. So in this way, the game's design is a bit conflicted - you could ignore the main quests and instead focus on machine hunting which will leave you quite powerful for the story content, or you could focus on the story and ignore the open world enemies which would make you rather underequipped when exploring. In a few areas, Horizon Zero Dawn draws many similarities to recent Far Cry games. As you explore the game world, you’ll come across a variety of activities. The landscape is populated with machine sites, so you can always see where certain groups gather if you’re in a mood for a hunt or need specific materials. The map is littered with campfires which act as save locations, as well as fast travel destinations. Fast travel does require single-use travel packs - at least until you craft the rare unlimited use pack. Optional activities include Bandit Camps and Training Grounds. With Bandit Camps, players must infiltrate an enemy encampment and eliminate all foes, as well as optionally free prisoners. The camps have an alarm device that is best left silent, multiple points of entry, and a bunch of foes patrolling around. The Training Grounds, meanwhile, offer a series of structured combat challenges with time limits. For example you could be tasked with taking out foes by hitting their weak points, or using specific ammo types. There are also short and linear platforming dungeons called Cauldrons - completing them unlocks Aloy's ability to override more machines. Overriding a machine such as a Broadhead lets you use it as a mount, while others will become friendly and fight on your side. To reveal larger chunks of the map, players can optionally climb Tallnecks, the towering robots with the sole purpose of providing you with a vantage point. Finally, there's Corruption Zones, areas where a mixed group of aggressive machines must be eliminated. There are only about five or so occurrences of each of these activities, so the game tries to offer variety over quantity. On your travels, you’ll spend time collecting plants and other materials, as well as looting defeated enemies. The materials are identified in the game world by UI elements and are then used for crafting, from basics such as ammo and traps, to upgrades like expanded pouch sizes. The pouch capacity upgrades are reminiscent of Far Cry as well, where you need specific increasingly rare materials to upgrade to the next tier. Weapons and outfits can also be slotted with one or more modification items, providing a small bonus to their function such as more damage or elemental effects. Managing your inventory feels a bit cumbersome as you have to dig down a few tiers of menus, but it’s clearly laid out once you get there. Anything you don’t need can be sold to merchants, and it’s also where you purchase new weapons, materials and outfits. It seems like the idea was that the players will be packing their inventory full of outfits, weapons, and traps as in most RPGs, so that they have a wide variety of options for any encounter. In reality however, it is far too expensive and also unnecessary. Despite always being overleveled for main quests, and looting everything, I could only afford to purchase a few weapons and outfits, and I saved up to ensure they were the end-game versions. And it was unnecessary because the majority of damage you take will be from melee attacks. The game dabbles with the concept of elemental damage - fire, electricity, ice and so on. While it is key on offense to use specific arrow types and elemental traps against machines with corresponding weaknesses, it is really not necessary for Aloy to have multiple outfits that are resistant to each specific element as you really don't take that much damage from it. Plus you've got potions that increase resistances to each element, but even those are rarely used. Much as the game is a combination of the RPG and action genres, the actual gameplay mechanics can be considered as a split between combat and stealth. For stealth, there is a constant indicator that shows how visible and how much noise Aloy is making, helping you stay hidden from machines and humans alike. In a bit of Uncharted-like design, patches of tall grass are scattered across most environments, and you will remain invisible to foes when in them, though it may not look overly realistic. The grass is key to a silent approach as hiding behind objects can be hit-or-miss without a cover system. One of the earliest skills you can unlock is the ability to perform silent takedowns from behind or from the grass, which makes stealth quite a bit easier. What makes stealth fully trivial, though, is another very early skill that allows you to whistle and attract exactly one enemy (whichever one you’re looking at) from a great distance. Luring machines and humans to your hiding place and taking them out, one by one, is very easy. If another enemy notices, they will come over to investigate the area, only to meet the same fate. You've also got rocks to throw, if you just want to sneak by without trouble. Players also have access to Focus, an item from the “old world” that Aloy discovered during her childhood, which grants her a special vision mode - and also factors heavily into the story. In this vision mode she is able to see all nearby enemies, scan machines to highlight their weak spots, and mark them for tracking. She can also highlight enemy paths, which can help with planning. You move and look around very slowly in Focus, so it's used for exploration only and can't be kept on during combat. With this ability, the only thing preventing you from perfect stealth missions is a lack of patience, larger machines that can’t be eliminated with a single blow, or an odd AI mishap. Maintaining stealth against human enemies is very easy and can be used for the entirety of the game, but the machines will give you more trouble. The machines in the game are a unique attraction, and they are expertly designed both from a visual and gameplay perspective. Most of the machines were clearly inspired by wild animals, such as horses, hawks, crabs, crocodiles, tigers and so on, and they behave in many similar ways. The relatively peaceful machines such as Grazers, Striders and Broadheads are designed to be passive and have just as much chance to flee as to fight. More predatory machines such as Sawtooths, Corrupters, and Glinthawks will engage you fairly quickly on sight. Most are found in groups, presenting players with strategy decisions on how to approach combat. When idle, the machines will roam the area, with the peaceful ones often gathering materials and thus being susceptible to stealth attacks, while the predatory types keeping an eye on the surroundings at all times. On a rare occasion, they will fight each other or tribal hunters. Later in the game, when you're faced with larger machines, stealth becomes unfeasible as they cannot be eliminated with a single attack - though starting a fight with a stealth strike is still a good choice. You can also sneak up and override a single machine, making it fight for you temporarily (or permanently, if you unlock the appropriate skill later). If you have a little time before engaging machines, there are also steps you can take to weaken them. Aloy can purchase a Tripcaster, which lets you place tripwires with certain effects, such as shocking any machine that wanders through. She can also craft and place individual traps that will damage/shock/burn any machine that steps on them. It is rare to use these traps, as the action is far too unpredictable and fast-paced; deploying them ahead of time isn't satisfying and takes too long for not much damage. The Ropecaster, on the other hand, is a very cool tool that lets you pin machines down to the ground. It will bring them down out of the sky, stop them from running around, and let you get a critical strike in. Larger machines need more ropes and a stronger variant of the Ropecaster, and it's always a very satisfying device to use. Aloy has got a variety of weapons and items to utilize. The spear has a light and heavy melee attack that does solid damage and can knock enemies over, leaving them open to a critical strike. With ranged weapons, there is plenty of choice - two types of bows (fast firing vs slow and precise), and a sling for lobbing explosives. As you progress through the game, vendors will stock stronger variants of these same weapons, which means more ammo choices, greater damage and more customization slots but the same basic function. Aloy has a limited time-slowing skill when aiming her ranged attacks, helping you land good hits where it counts. Aiming for weak spots is always the best idea, because most other areas won't do you much good. Attacking certain points, such as storage containers, will result in explosions which severely damage the machine; using weapons with environmental ammo is also great at temporarily immobilizing susceptible foes. You can even blast away weak points of a machine by using armor tear ammo and remove their weapons, leaving them without a corresponding attack ability - and with large machines, you can even pick up that broken off weapon and use it against them. Once you're engaged in combat against medium and large machines, Horizon Zero Dawn is fairly intense. If you took a few shots from cover and aren't immediately visible, some of the machines have a scanning ability that will reveal your location while the rest search the area. All machines are quite aggressive in combat and feature a few different attacks that you must be on the lookout for. Some can melee you to death in a single attack combo if you fail to dodge out of the way, so it's very important to stay on the move. At a distance, the machines typically use their ranged abilities if they have any, and these often involve environmental attributes like spitting ice or fire at you. These ranged attacks have a nasty habit of predicting where you're dodging, and land ahead of where you're moving. Aloy doesn’t possess much health, and even as you purchase end-game outfits and weapons, machines continue to pose a threat. Fighting several medium machines is always tough, and often results in Aloy running around, desperately consuming health potions, and striking whenever it is viable. This level of difficulty persists to the end of the game, making you feel like you're always outmatched, and any encounter with a larger machine can be deadly. Though if you do perish, you simply restart at a campfire without much progress lost, so while combat against the machines is challenging and complex, it's not punishable. Though exhilarating, combat can feel a bit clunky. Aloy has a tendency to teleport a bit to make sure her attacks land, and getting up from being hit by machines is a long animation. Aloy also has rather long attack animations and executing them at the same time as machines will see you both take damage. Trying to fight multiple medium machines is tough, so you can forget about making yourself look good with perfectly placed shots, switching to the right ammo type every time, and so on. It's a frantic fight for survival, and especially late in the game where it's simply easier to go in swinging with melee, chugging health potions, and trying to get it over with quickly. You might catch a breather on occasion when the AI stands and stares, or gets caught on something in the scenery, or somehow loses sight of you. There are even moments when you get a free kill because the machines don't quite know what to do. The medicine pouch (which can only be refilled by gathered plants) is always bound to Up on the D-pad. The rest of your items, however, must be cycled through using left/right, and are used by pressing down on D-Pad. During an intense encounter, it can be frustrating trying to survive while frantically cycling through your potion and traps list to get to the one you need. While things are quite chaotic facing multiple machines out in the wild, it is still thrilling fun. But it's the encounters against large machines, one on one, that are so highly memorable and produce the sorts of adrenaline rushes that players often yearn for in action games. Fighting your first Stormbird or Rockbreaker is imposing and intense, not unlike your first awe-inspiring encounter with a dragon in Skyrim. It's during these encounters that you'll be truly able to focus, and push your skills and weapons to the limit, trying to hit every weak spot and environmental weakness. These fights will drain your energy and materials, require you to improvise, but feel so, so highly satisfying. These boss-like encounters don't happen too frequently, but should you find these beasts out in the open world or during a quest, it's always a great time, and one of the big reasons to check out the game. There is also occasional platforming, though it's very simple. Any climbable areas feature ledges and handholds that are clearly identified, so there’s no environment exploration like in Tomb Raider or Uncharted. Aloy climbs quickly and the paths are linear; often you don’t even need to press jump to get to the next ledge. It's also fairly restrictive, as you can't jump on anything taller than waist-high unless it is a designated climbable ledge, which looks awkward as you explore the game world and can't scramble up on top of small rocks. The game has no puzzles to speak of, but there is an absolute ton of collectibles, from data points and voice recordings that fill out the lore, to trinkets and special items. Horizon Zero Dawn is quite a lovely looking game. Aesthetically, the open world is quite reminiscent of Far Cry 4 and Far Cry Primal; you've got dense jungle, snowy mountains, a desert area, and the lovely valleys in between. Each area looks great and feels distinct, and outposts or villages can be seen from a distance. A full day / night cycle with impressing lighting, alongside occasional rain, fog, and sandstorms helps the game world feel immersive. The design and animations of the machines is top notch and full of detail, and seeing their glow in the darkness of the night is both imposing and mesmerizing. The game does have 4K support and visual enhancements on the PS4 Pro, but this was not tested in the scope of this review. In the audio department, the soundtrack is well crafted though it largely serves as background music, aside from the memorable main theme. Dialog and voice acting is rather excellent for the main characters and their story, but less so for the side quests and minor NPCs who often repeat the same lines over and over. A couple of minor presentation blemishes do appear, however. The game was completed on a launch PS4 model, and it did have very rare framerate dips, shadows clipping, map screen loading delay, and a few graphical bugs - such as the reflection of a tropical forest on a lake in the middle of a desert. Lip syncing leaves much to be desired even for Aloy, and the characters look rather artificially shiny after it rains. Also, annoyingly, when there are cutscenes with dialog choices, the bottom third of the screen is darkened. This looks OK when the dialog menu is visible, but this area remains darkened throughout the entire cutscene. 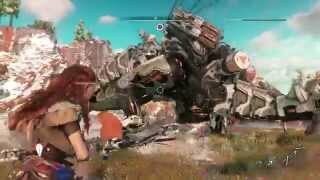 With audio, the game suffers from mixing problems; there are many cases of overlapping conversations in the open world between NPCs, all at the same volume, also drowning out whatever chat Aloy could be having. You could miss important story dialog because the game begins playing scripted audio announcements, or you entered the next room and a new conversation either drowns out or cuts off the old one. There are also many cases where some sound effects are simply missing in cutscenes or very poorly normalized in volume. Though it borrows a few elements from other games, Horizon Zero Dawn is greater than the sum of its parts and a very promising new IP. It's almost two games in one, which is why this review is so lengthy. As an RPG, it tells a thrilling main story with interesting characters and a very unique setting, but also suffers from forgettable side quests and questionable leveling progress. As an action game, it is a highly original and involving take on monster combat, offering players with tons of tools to take down the menacing machines. The open world combat against multiple machines can get quite messy, but the almost cinematic one vs one showdowns against large mechanical beasts is the stuff that gaming memories are made of. Chances are you haven't played a title quite like this before, and for action fans in particular, it is well worth checking out. A very solid audiovisual package, though not without a few minor issues. As an RPG, the game offers plenty of loot, inventory management and NPC interaction, though not all of it is well balanced. In stealth, it's fairly trivial but still satisfying. And as an action game, Horizon Zero Dawn a thrilling series of unpredictable encounters against deadly machines. The main story is a clear highlight, offering a great sci-fi narrative with memorable and likeable characters throughout. Much of the side content falls flat, however. The game runs without any major technical issues on the launch model PS4. Horizon Zero Dawn offers an entirely unique world and a thrilling experience as an action game, complete with a great story and likeable characters. It doesn't reach its grand RPG aspirations, but the highs are so memorable and entertaining that it's easy to forgive the shortcomings. 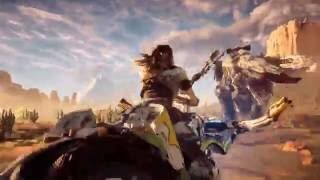 "Mankind and machines collide in a unique vision of the future"
Horizon Zero Dawn is ranked #450 out of 1434 total reviewed games. It is ranked #29 out of 174 games reviewed in 2017.